My husband and I thought that it was a heart warming movie -- we laughed and cried. That's a lot from a cartoon. My three year old son thought that Dug, the talking dog, was hilarious. And my five year old daughter??? As soon as the movie was over she said "I never want to see that movie again! Not in a theater and not at home!" How's that for making her opinion clear? My daughter is such a sensitive soul that she was unable to embrace the action packed portion of the movie after watching the first third of the movie. (A few scary dog scenes didn't help either.) I have to say I can't blame her -- "UP" has been advertised as a fun adventure movie with thousands of helium filled balloons and a floating house! I think that children should be exposed to life, but not without the parents knowledge thanks to false advertising. 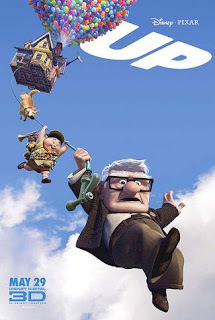 Even the "UP" website itself calls the movie a "comedy adventure". Do I recommend this movie? Yes, but consider showing it to the more sensitive in your family when they're a little older or, as we did, discuss the movie while watching it and then in more detail after. Please Note: I hate spoilers, but anyone that wants them can e-mail me (or leave an e-mail address here) for more details. UP made me laugh and cry as well. I thought it was a touching movie, but I can see how parts of it would make a sensitive child not want to see it again.